I’m not the only journalist in the family. Over the weekend, my spouse went to CatchCon, a convention for fans of “The Deadliest Catch,” a Discovery Channel show she has covered in a column she writes for USA TODAY. When she got home, she said I may still have a chance to draw two crab boats from the show that were docked by the Bell Harbor Conference Center for the 500 ticket-holders to tour. I couldn’t say no. 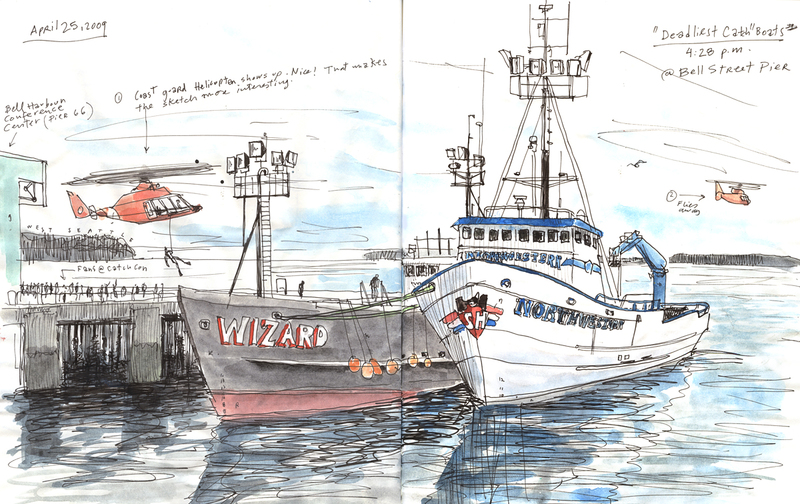 I zipped down I-5 to Pier 66 just in time to sketch the Wizard and the Northwestern as a Coast Guard helicopter and its crew staged a simulated rescue for the fans. Have I mentioned what a catch my wife is? Note: You have to register to leave comments, it only takes a minute so do it now before you forget! Once you log in the first time you won’t have to do it again unless you erase cookies on your browser.